One-hundred people joined protests today at the Swedish, Latvian, Luxembourg, Norwegian and German Embassies. The protest at the Danish Embassy was cancelled following their expression of support for a Commission. The protests were led by Wai Hnin, Campaigns Officer at Burma Campaign UK, and daughter of Ko Mya Aye, whose 44th birthday is today. Burma Campaign UK today also published a briefing on how the detention and treatment of political prisoners in Burma constitutes crimes against humanity. A government representative from the Latvian Embassy, who met with the delegation from Burma Campaign UK, Wai Hnin, Zoya Phan and Jacqueline San, this morning, stated that the Latvian government ‘supports in principle a UN Inquiry’. The Swedish Deputy Ambassador met with the delegation, pledged strong support for human rights and democracy in Burma, and promised a response on Sweden’s position on a UN Inquiry soon. The Luxembourg and Norwegian Embassies also promised a response at a later date. The generally polite and warm reception at these Embassies was in stark contrast to the reception at the German Embassy. The German Embassy at first refused to allow the delegation of three into the Embassy to deliver the letter, only backing down when the delegation pointed out all the other Embassies had been happy to have three people in the meeting. However, a German Embassy Security Officer stayed in the room while the meeting took place. The Embassy also told protesters outside to move across the road. When they refused, as the German Embassy does not have the right to tell people where they can stand in a public street, the German Embassy called the police. The police declined to tell the protesters to move. The German government representative refused to express support for a UN Inquiry, and told the delegation to go and protest at the French, American and Chinese Embassies instead. 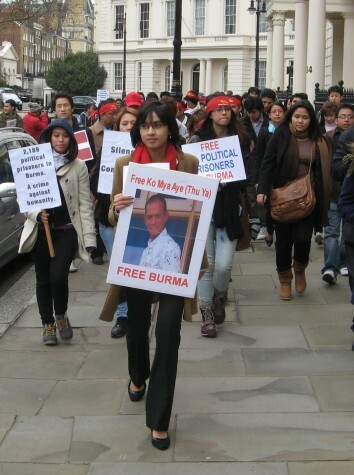 Wai Hnin, Campaigns Officer at Burma Campaign UK, leads 100 people to hand in letters to European Embassies in London to call for support for a Commission of Inquiry into crimes against humanity, including the detention and treatment of political prisoners in Burma. Demonstrators outside the German Embassy in London.